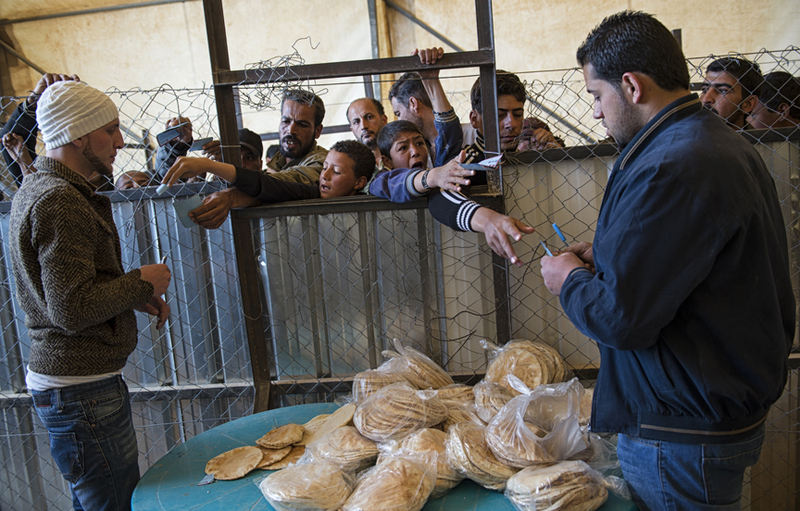 Syrian refugees collect their daily bread ration at a distribution administered by the World Food Program at the Zaatari refugee camp in Jordan, April 8, 2013. WFP distributes 500,000 pieces of bread each day to roughly 100,000 Syrian refugees living in the camp, and at this particular bread distribution, riots erupt almost daily as the refugees fear they will not receive their bread rations. As the civil war in Syria enters its third year, a steady stream of civilians continue to flood neighboring countries hrough official and unofficial border crossings as they flee ongoing violence; the United Nations estimates that the number of Syrian refugees is currently over one million.